An unglazed biscuit carved porcelain box of circular form, supported on a short, straight foot. 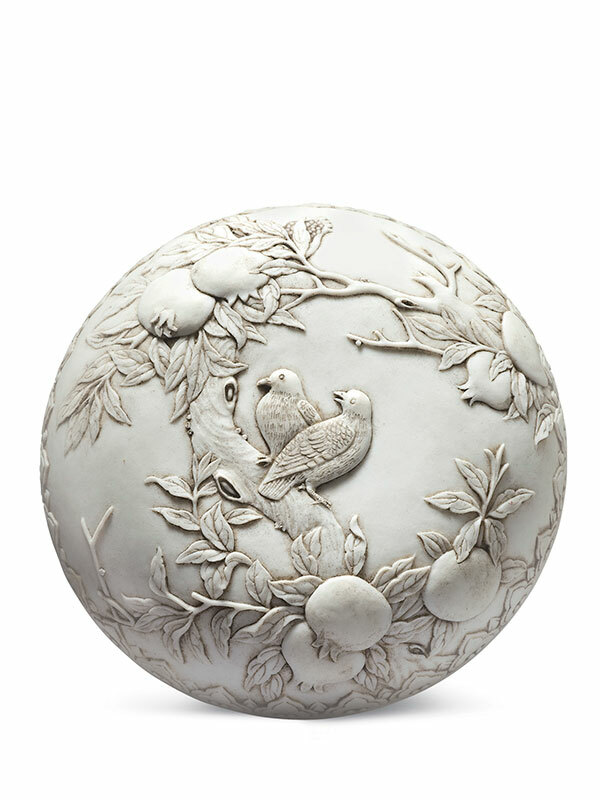 The domed top is carved in high relief with two magpies on a branch of a leafy pomegranate tree that bears fruit. 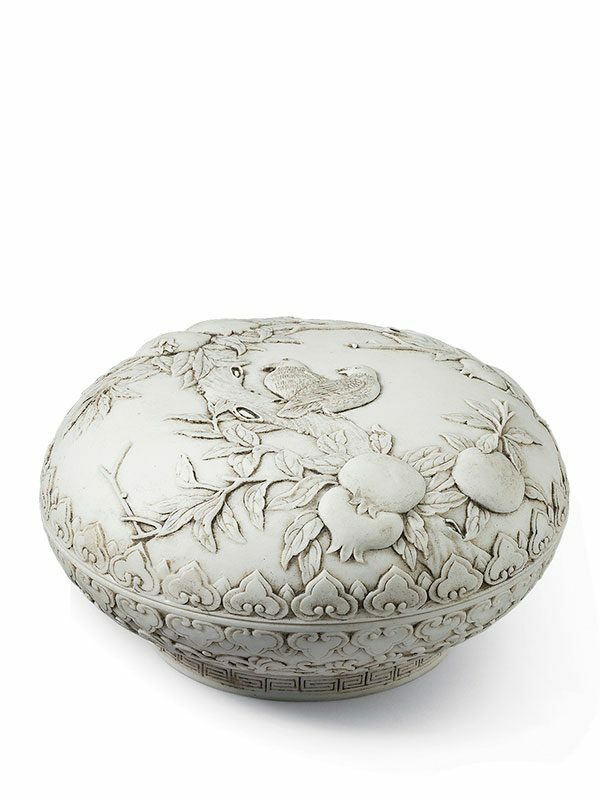 The side of the box is decorated with a densely carved design of lotuses with tendrils. The rims of both the cover and the box are decorated with a band of ruyi pattern, whilst the foot is carved with a band of key-fret pattern. The recessed base is carved with a six-character reign mark in seal script of the emperor Daoguang, Da Qing Daoguang Nian Zhi (Made in the reign of Daoguang). Biscuit (twice fired) porcelain is a type of unglazed porcelain with a matte appearance and texture to the touch. Carved porcelain (diaoci in Chinese) was inspired by carvers of other materials (i.e. ivory, bamboo and lacquer) and came into fashion in China towards the end of the 18th century. The decoration was carved when the porcelain had dried to a certain hardness but before it was fired in the kiln, creating a three-dimensional effect with a depth that is not available in painted porcelain. The most famous carved porcelain potters, praised as ‘skilled craftsmen’ at the time, are Chen Guozhi, Li Yucheng, and Wang Bingeing. The present box, featuring exquisitely and naturalistically depicted birds and plants and showing a high technical and artistic standard, was most likely made by Li Yucheng, who favoured unglazed works and was active during the Daoguang period. A few of his works are closely comparable and have a similar naturalistic style and motifs: a slightly smaller circular box covered in transparent glaze is in the Baur collection; an unglazed brush pot is in the collection of Mr. Tony Miller; and another brush pot in a light yellow glaze, similarly depicting two birds among blossoms, is in the collection of Mr. Humphrey K. F. Hui. Reign marks are comparatively rare in carved porcelain wares, but artists began making and signing individual pieces from the Daoguang reign. Only two other known examples bearing the same six-character Daoguang mark in seal script are published: the first is a rectangular unglazed box carved with landscapes and figures in the collection of the Victoria and Albert Museum; the other is a brush pot covered in yellow glaze in the collection of the Art Museum at the Chinese University of Hong Kong. Another carved circular box of similar size, comparatively adorned with ruyi and key-fret pattern and bearing characters for ‘longevity’, is dated to the Qianlong period and in the Baur collection.